First I want to motivate one more time, why this article is placed on this website, since this article is all about moto-cross and not BMX. Insiders in the sport of BMX know, that Pierre Karsmakers was the first importer of BMX bikes, parts and clothing, coming from the USA, starting in 1976. He was actif in BMX sales till ending '80 s. Because of this link and Pierre being my brother in law, I decided to publish this article on this site. Early 2013 during one of our coffee drinking talk sessions at Pierre Karsmakers "men's cave" in Aalst-Waalre, I told the guys pesent that it would be a great idea to sent in a nomination on Pierre, for the AMA Motorcycle Hall of Fame in the USA. 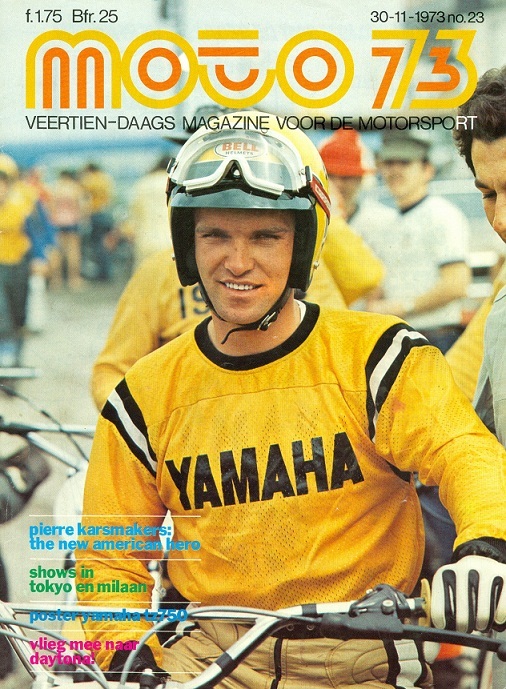 Not many people in Holland know what Pierre had accomplished during his moto-cross career in the USA from 1973 up and till 1979. To inform the general public, I did write an article on my website (universityofbmx.com) about Pierre's career (check Old & New's, the "Pierre "PEPE" Karsmakers story") acouple of years back. Shortly after us talking about it, one of the men present, Peer Bijnen, took the initiatif (without telling us) to nominate Pierre at the AMA for the motorcycle Hall of Fame. A couple of weeks later, Peer Bijnen received a letter with an application form, which he then gave to me: you finish this Gerrit, he said. I answered all the questions on the application form and mentioned the details on Pierre's career concerning titles won, results etc. etc. in Holland and the USA. This nomination form was then sent back to the AMA Nomination Committee by me, where the details were scouteneered, checked and proven correct. Through e.mail I received confirmation that the Nomination was now officialy (ending 2013) and had to go through 2 or 3 more committees within the AMA HoF, before a final answer good be given on a possible membership of the AMA Motorcycle Hall of Fame for Pierre. The final word was received sometime May of 2014: The AMA announced officialy Pierre Karsmakers as 1st. inductee out of 7, on June 19th. 2014. The other inductees were Tom White, George Barber, Scott Summers, Rob Muzzy, Byron Hines, Mike LaRocco and Hall of Fame member Willie G. Davidson would become "Legend", within the AMA Hall of Fame. 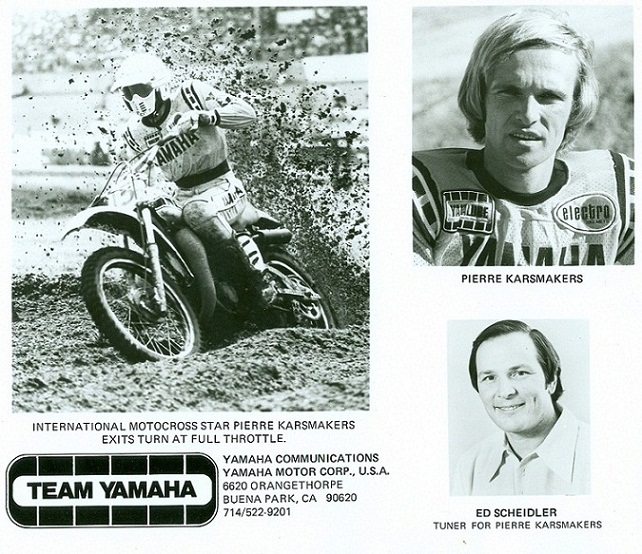 Pierre Karsmakers, one of the first European motocross champions to bring his expertise to America, has been elected to the AMA Motorcycle Hall of Fame Class of 2014. "Pierre showed Americans what motocross was all about," said Ken Ford, a member of the Hall of Fame executive committee and treasurer of the American Motorcyclist Association board of directors. "From his performance on the track to his training regimen, he demonstrated a firm resolve to wring the most from himself and his machines." Karsmakers said he was honored by his election. "It's been a long time since I raced, so it means a lot that America still recognizes me as one who brought motocross to the United States," Karsmakers said during a recent telephone interview from his home in The Netherlands. 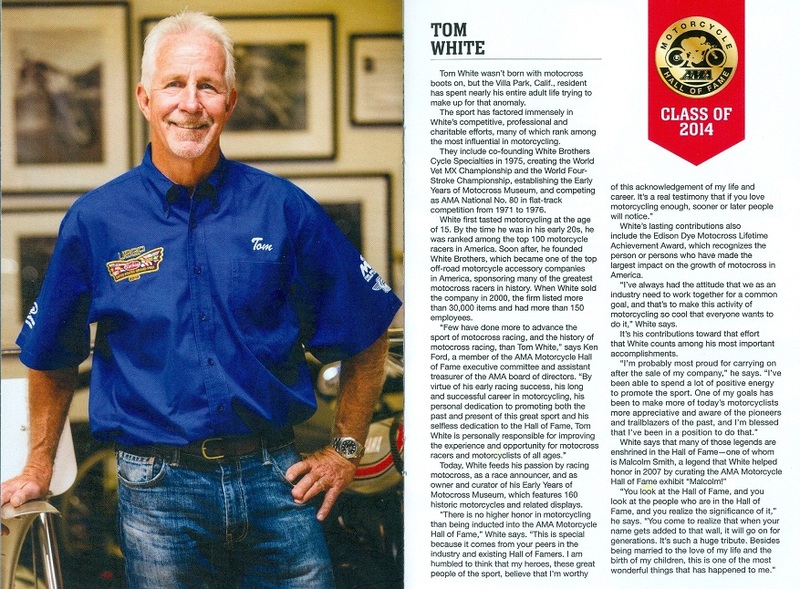 The 2014 AMA Motorcycle Hall of Fame Induction Ceremony will be held on Friday, Oct. 17, as part of the AMA National Convention, Oct. 16-19, in Orlando, Fla., and in conjunction with the American International Motorcycle Expo (AIMExpo). Tickets for the convention and the induction ceremony go on sale soon. For more information, see www.motorcyclemuseum.org. A three-time motocross champion in his native Holland, Karsmakers came to the United States to gain wider exposure and attract the attention of the Japanese motorcycle makers. "All the Japanese (sponsorship) contracts were going to Belgian riders," Karsmakers said. "I got mad, because other European riders were not getting noticed. But after I started winning in 1972, it began to open doors." Racing for Yamaha in 1973, Karsmakers won the 500cc motocross national championship series, scoring 2,659 total points. The second-place racer scored 1,427. 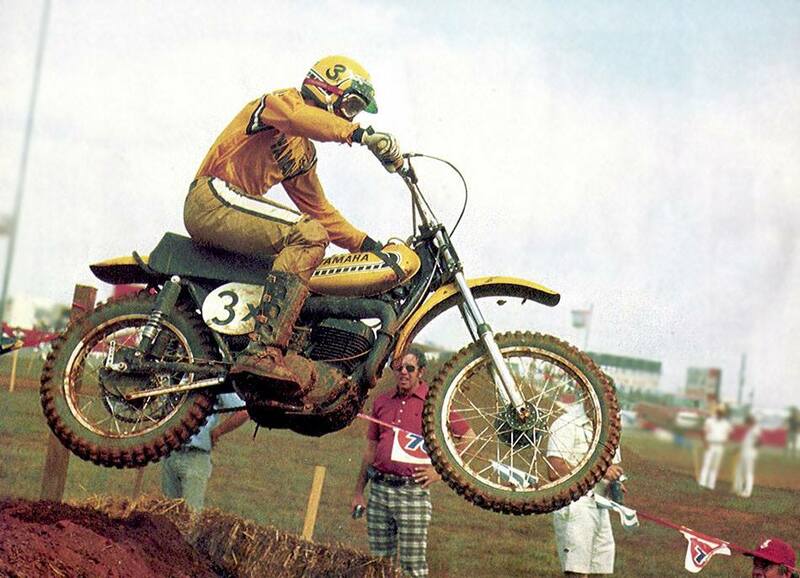 Karsmakers also was winner of the inaugural AMA Supercross Championship in 1974. He retired from racing in 1979. "That was a great time of my life," Karsmakers said. "I met many wonderful people." 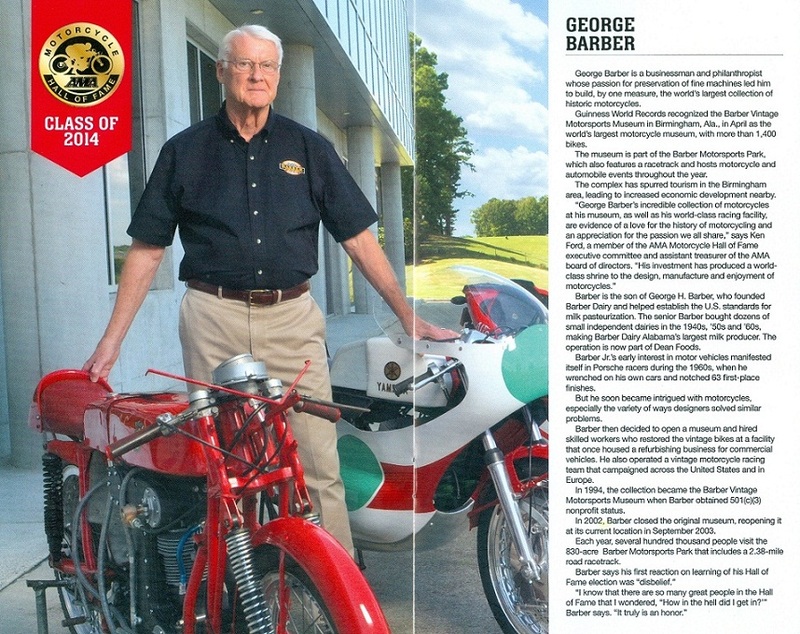 Karsmakers is the first member of the AMA Motorcycle Hall of Fame class of 2014 to be announced. The remaining 2014 inductees will be announced in random order in the coming weeks. 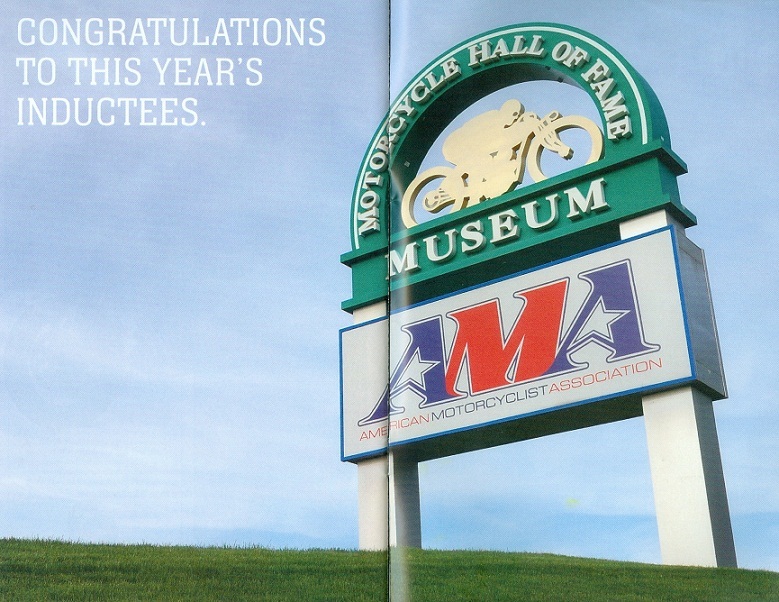 AMA Motorcycle Hall of Famers are selected through a nomination and voting procedure that includes ballots cast by living Hall of Fame members, members of the American Motorcyclist Association and AMHF boards of directors, and members of, and advisers to, the Hall of Fame category committees. To nominate a future Hall of Famer, visit www.motorcyclemuseum.org/induction. Planning and our actual trip to Orlando. Allthough I did not have the intention of going to the USA this year, reading about Pierre being an inductee in the AMA Motorcycle Hall of Fame, I decided after consulting my wife to go with Pierre to this unique event in October. The AMA wanted all inductees to be present on October 16th. Yamaha Motor Corporation, USA asked Pierre to come over one day earlier, so he could be present at the official presentation of the new Yamaha road and off road motorcycles in the Chapin Theatre inside the Convention Centre. Yamaha dealers from all over the USA would be present and Pierre would be presented to them as their "Yamaha family member" ánd AMA Hall of Fame inductee. We left Schiphol Airport - Amsterdam on October 15th, with a delay of over 3 hours. Because of the delay we missed our connecting flight and had to wait another +3 hours in Detroit-USA. 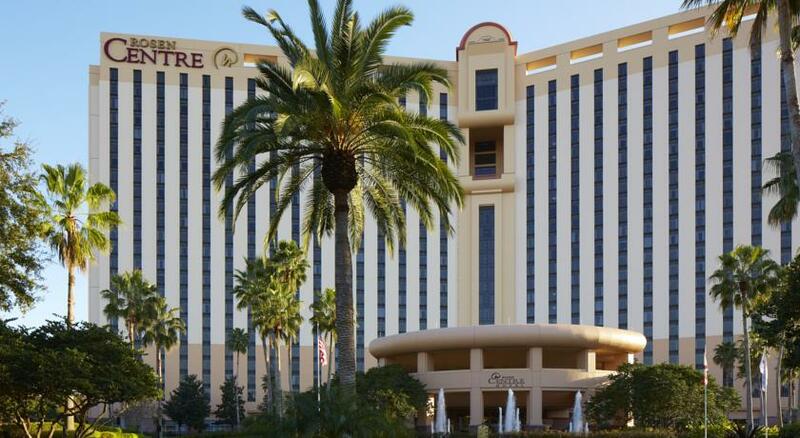 After 23 hours travelling we arrived at the Rosen Centre Hotel at the International Drive in Orlando. After check in, Pierre contact Yamaha's General Manager - Communications, mr. Bob Starr and arrangements were made to meet early October 16 at the Chapin Theatre were the presentation of new Yamaha products would take place, starting that Thursday at 10.00 hours. By the way, just about 2 weeks before leaving for Orlando I learned that my youngest son Pieter Does (Twin Air) would be at the AIMExpo too for TWIN AIR. So we made an appointment to meet en have diner all together and so we did. Scheduled activities Yamaha ánd AMA. After a good nights rest, Pierre and I went to the Chapin Theatre directly after breakfast to be present at the Yamaha motorcycle presentation models 2015, at 10.00 hours. Back stage we did meet with Colin Edwards and his wife Alyssia, who were involved in presenting a Yamaha roadbike, We also did meet the GNCC (Grand National Cross Country) Champ as well as moto-cross rider ..................... Bob Starr explained to Pierre what would happen during the introduction of this presentation. The CEO of YAMAHA USA would be introduced to all Yamaha dealers present as well as Pierre. We saw a great show of about 1 hour in which the Dennis McNeal, Vice President Motorcycle Operations and Derek Brooks, Motorcycle Product Planning Manager of Yamaha Motor Corporation USA, introduced the new Yamaha 2015 models. Afterwards many dealers and others came over to Pierre congratulating him, becoming an AMA Hall of Fame member the next day. The introduction of this Yamaha presentation was done by Bob Starr. After a welcome to all present, Bob introduced the CEO of Yamaha Motorcycle Corporation ánd AMA HoF inductee Pierre Karsmakers, a Yamaha family member as Pierre himself stated later on, to the USA and Canadian Yamaha dealers present. The actual presentation of the 2015 models started by Dennis McNeal riding on to the stage on a Yamaha Bolt. Then Derek Brooks welcomed him and invited Dennis to explain all about the new Yamaha Bolt roadbike. The new Yamaha scooters were introduced and in short Dennis also explained a little about the new race bikes (not present at this presentation). These would be presented in Milan - Italy, a couple of weeks from now. Dennis also explained about the new entry-level Supersport bikes on which experienced riders as well as un-experienced riders could have a lot of fun and riding pleasure. To demonstrate that, Colin Edwards and his wife Alyssia did a road test on these bikes of which Yamaha made a short video which they showed. This was a fun video to watch. Personaly I enjoyed myself very much. It was good to see how Yamaha organized such an event. Learned a lot again this morning and did meet interesting people through PK. Yamaha's Bob Starr invited us (so, Pierre and Gerrit) to be present at the Reception and the "Feed the Children Charity Auction" by Yamaha later on that evening on Thursday October 16th. in room W.304 at the Convention Center. Also Nation wide (USA and Canada) distributors and dealers were invited ánd present. Since a couple of years now, Yamaha Motor Corporation USA organized an auction, gathering money to fill 2 truck with food for children. That food will be distributed during Christmas time among poor children. Many items were brought in as you can read on the chart below. Among those items a large picture/photo of Pierre with his signature on it. With us at the table was Hall of Fame member mr. Don Emde. Pierre Karsmakers picture, ready to be auctioned. A Valentino Rossi cap was auctioned and Colin Edwards, former teammate of Rossi, got this cap for around 160 dollars. Special parts of factory racebikes were auctioned at an average of around 4 / 500 dollars. An original race-suite of Rossi was auctioned at 11.125 dollars and that of Lorenzo of around 7.000 dollars. Those were the top items auctioned. Pierre Karsmakersgraphed photo (action picture, PK on a Yamaha ofcourse) was auctioned at 1200 dollars, out of the smaller items this photo got top price. Colin Edwards and Don Emde also did bit on the photo, but finaly a Yamaha dealer got he highest bit. All together the auction generated over 38.000 dollars, which ment that not 2, but at least 4 trucks of food were available around Christmas time this year, to "Feed the Children". Fantastic initiatif of Yamaha Motor Corporation USA. Yamaha dealers present that bought all items were happy too and will show off their items won in their shops probably. Yamaha's Bob Starr coordinated the evening ánd auction. Yamaha dealers and distributors from the USA and Canada were presented food and drinks during the evening. We all had a great time and the auction was a great success. Here some picture with a comment to give you all an overall impression of this happening. This auction / reception ended at around 22.30 hours. What a great evening this was, another fantastic experience for both Pierre and myself. On to the next day! Thursday October 17th. 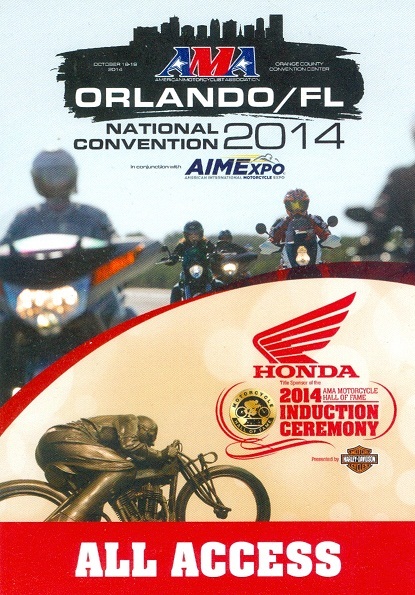 2014, the day of the AMA Motorcycle Hall of Fame induction ceremony. The AMA had scheduled a Eagle Rider Kick-Off Party on October 16th, which Pierre could not attend because YAMAHA's Bos Starr had asked Pierre to be present at the Yamaha Auction on that Thursday evening. As I explained before, since a few years, Yamaha organizes an auction of motorcycle related products being donated by many people and Yamaha itself. The proceeds of this auction will go to sharity for 100%, Feed the Children. During a Reception type of gathering with food and drinks, Yamaha dealers came together in one of the large halls at the Convention Center. The goal for this evening was, generate enough money for 2 truck loads of Food for Children. The auction was such a success, that now they were able to not fill 2 trucks with food for children, but 4 trucks ! Friday, October 17th, prepairing for the AMA Hall of Fame ceremony. Pierre and I (as a guest) were expected to be present at 8.00 hours for the 2014 Hall of Fame Inductee/Legend breakfast in room W/306A, West Building of the Orange County Convention Center. All inductees and guests were introduced to eachother and emcee Perry King explaned during breakfast the procedure during the rehearsal, later on that morning and afternoon. Arriving later that day were Mike LaRocco and Willie G. Davidson (so, they were not present at this breakfast meeting). After breakfast, Pierre Karsmakers was the first one to do his 30 minutes rehearsal together with emcee Perry King. Allthough everybody involved was kind of nervous and emotional the first time presenting their speech, all went well. After Pierre's rehearsal, we watched Tom White giving his speech after which we left the Chapin Theatre to have a first look around at the AIMExpo. On our way to the Expo as well as walking around at the Expo many people congratulated Pierre when they saw him. I was very surprised how many people still knew Pierre and are a FAN of him. After rehearsal, Pierre, Perry and a fromer sponsor of Pierre, checkd out Pierre's Yamaha. From 18.00 till 20.00 hours the official part of this Hall of Fame happening started with the AMA Motorcycle Hall of Fame Inductee/Legend Reception in the Valencia Room of the Convention Center. Again, many old friends of Pierre present, came over to congratulate him and talk "history". Very special moment when Pierre did meet Craig Blackwell, whose family took very good care of Pierre and his family, in the beginning of his long stay in the USA. The AMA Motorcycle HALL of FAME ceremony. Around 19.45 hours we all moved from the Valencia Room to the Chapin Theatre. At 20.00 sharp the AMA Hall of Fame induction ceremony started. Perry King welcomed everybody and introduced the President and CEO of the AMA, Mr. Rob Dingman. Mr. Dingman also welcomed all present and specialy the 7 inductees and the to be Legend. An AMA Hall of Fame video was shown and an explanation was given how the AMA Hall of Fame worked/was organized. After a general Hall of Fame related introduction by Perry King, the emcee during this happening, Perry introduced the 1st. inductee of this evening, Pierre Karsmakers. An about 5 minutes during video was shown on Pierre´s career in the USA. After this video Pierre came on to the podium together with Ken Ford / AMA and Barry Higgins / AMA Hall of Fame member. Pierre was offciaily inducted into the Hall of Fame by Ken Ford, one of the AMA Board of Directors and the AMA Motorcycle Hall of Fame ring was presented to him by Hall of Famer Barry Higgins. Pierre's induction speech went very well, allthough emotional at the end as all other inductees were. Following Pierre were the inductees Byron Hines, George Barber, Scott Summers, Tom White, Mike LaRocco and Rob Muzzy. Each and everyone of them had great and personal speeches and all of them were kind of emotional at the end of their speech. 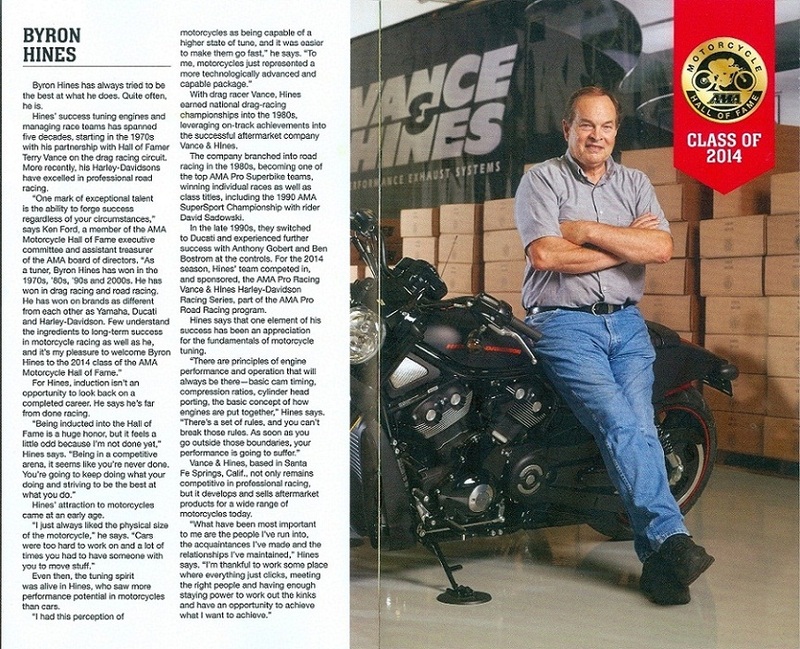 Last but not least, AMA Hall of Fame member, William "Willie G." Davidson, was upgraded to the level of Legend. What a great man and fantastic speech. Willie G. got a standing ovation. You can find all introduction video´s and speeches of all mentioned above on YOUTUBE. In the end, all Hall of Fame members present, including the newly inducted Hall of Fame members were asked to come up oin the podium, pictures were made and best wished exchanged. What a fantastic evening this was with a couple of hundred people present in this theater. Seen here the new AMA Hall of Fame members, class of 2014 (not in picture the representative of mr. George Barber and Legend Willie G, Davidson). From let to right: Scott Summers, Rob Nuzzy, Tom White, Pierre Karsmakers, Mike Larocco and Byron Hines. At the end of the AMA Motorcycle Hall of Fame induction ceremony, not only the new members were asked to come on the podium, but also the Hall of Fame members present in this theatre were asked to join the new members on the stage, so they did. Seen here a special moment were Harley Davidson's, Willie G. Davidson, now promoted to Legend, congratulated Pierre Karsmakers with his HoF membership. 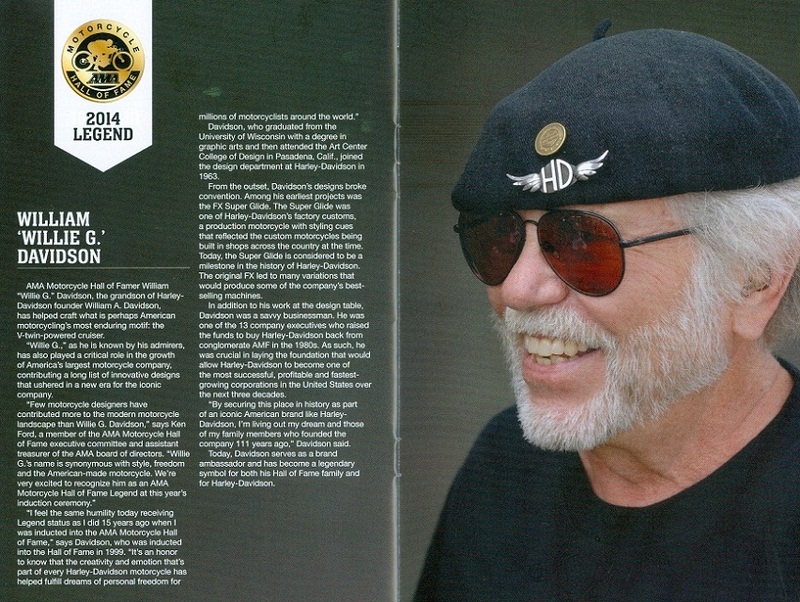 Promoted from AMA Motorcycle Hall of Fame member to LEGEND was "Willie G." Davidson. Congratulations to all ! Seen here some more pictures of the Hall of Fame ceremony on October 17th. 2014, taken after the ceremony. Personaly I was very happy to see my youngest son Pieter Does being present at this Hall of Fame event. 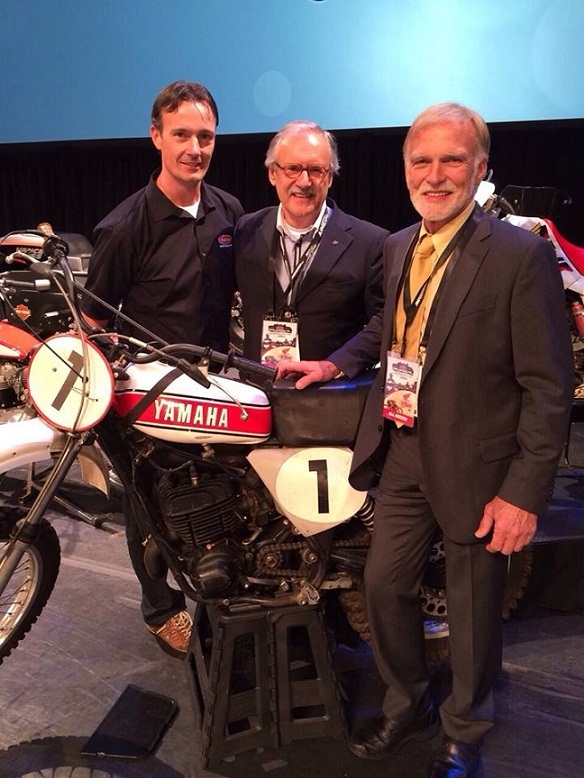 Pieter visited the AIMExpo business wise on behalf of TWIN AIR and was also able to be present at the induction ceremony of his uncle Pierre Karsmakers. 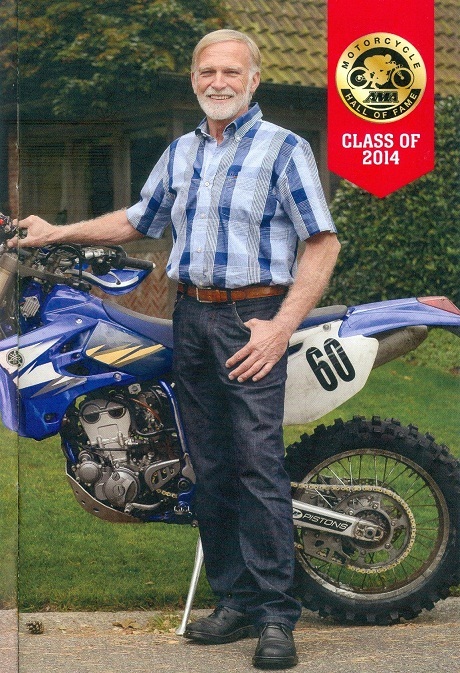 AMA Motorcycle Hall of Fame member, Pierre Karsmakers, class of 2014 and his original unrestaured Yamaha. Also interesting to know might be the fact that Pierre Karsmakers is the 11th. 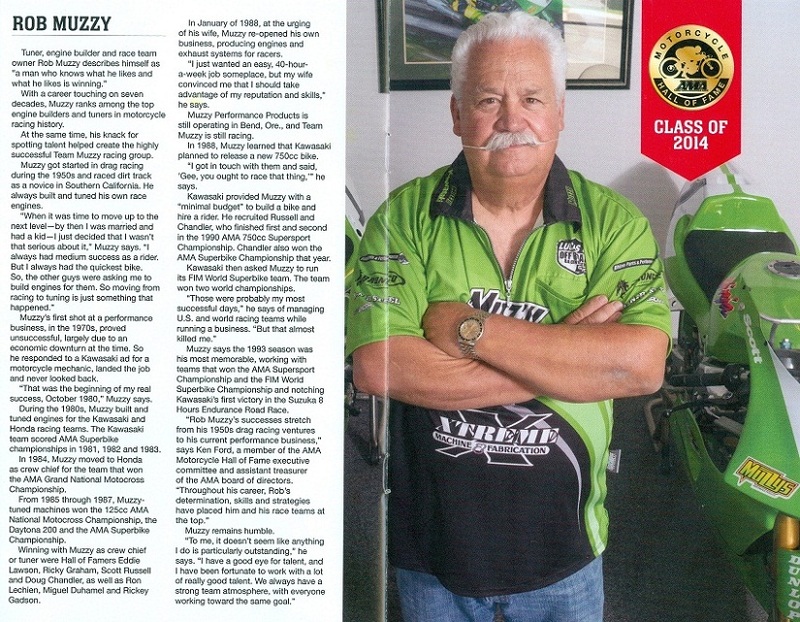 European rider from moto-cross, being inducted in the AMA Motorcylce Hall of Fame. Members before him are: Roger De Coster - Torsten Hallman - Gunnar Lindstrom - Heikki Mikkola - Joël Robert - Derek & Don Rickman - Jeff Smith - Rolf Tibblin - Jean Michael Bayle and recently Pierre Karsmakers. Well done PK. AIMExpo Saturday and Sunday, October 18-19th. 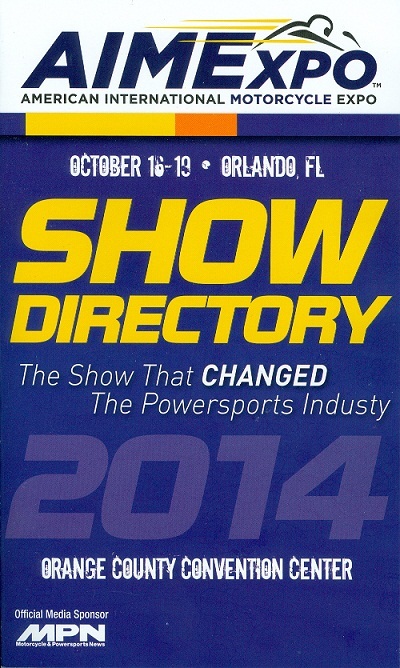 The AIMExpo at the Convention Center in Orlando took place from October 16th. on and the first 2 days, only dealers and businessmen were allowed in. From Saturday till Sunday the general public was allowed inside as well. As new AMA Hall of Fame members, they all were scheduled for Autograph Sessions in the AMA booth on both days. Again during those days, Pierre ran into many people he knew or whom knew Pierre from the early days very well. All congratulated him with his AMA Hall of Fame membership. To me it was a big surprise to see the appreciation from realy everybody for what Pierre did for moto-cross in the early days. A selection of other friends that Pierre dit meet during this trip and at the Convention Center in Orlando along International Drive. Personaly I ran into several old friends from the BMX scene as well, among them Tod Huffman (former GT Bicycles), "Big E" - Eric Bartoldus, Tony Szynaka and his 2 daughters, Dave and Erma Miller and husband, McGoo and ofcourse we made arrangements before coming over to meet my best friend Greg Esser and family (Melanie and Alex). Also did ran into Jody Weisel (Moto-Cross Action Magazine), whom I did meet at Saddleback Park several times, when I was staying at Pierre's in the mid '70 s.
It was very interesting being at the presentation of the PENTON History film, in the "Motorcycle Filmfestival theater" at the AIMExpo, made by again an old friend from BMX, Todd Huffman. Todd has been working on this 2 hour film for about 3 years and tells the story of the Penton family. Penton did business with KTM in Austria many years ago and was the first to bring in KTM motorcycles, which he sold under the PENTON name in the USA. Fantastic story, very interesting. At another podium, Don Emde told the story and showed slides of the yearly CANNONBALL RUN he organizes for around 30 participants, riding the oldest possible route of this unique event. Saw interviews with Kevin Schwantz and others. On Monday October 20th. we left Orlando for Holland, were we arrived on Tuesday October 21st. Conclusion of the two of us was: what a great 6 days, fantastic experience, a very proud PK, did meet many supporters, fans and old friends. We had some great weather in Orlando, sunny and hot. Arriving early Tuesday morning at Schiphol Airport - Amsterdam, the weather was cold and wet as you can see on this pictures. Personal note from my side: The USA BMX Hall of Fame diner and induction ceremony at Chula Vista, Ca., has been a very well organized event. I was present there on several occasions. However, the AMA Motorcycle Hall of Fame is a more professional and Hollywood style event. It was great to have been a part of that event this year, learned a lot again! On my "THINGS TO DO" list is still the wish to organize a European BMX Hall of Fame diner and induction event, sometime November of any year soon, according to the AMA HoF concept. I am looking for some realy serious sponsors to help me out here and I want to make such an event look like a mix between the USA BMX and AMA Hall of Fame event. Anybody interested in helping me out? Last but not least. I did realize myself just recently how special it is to have two family members in an American Hall of Fame. 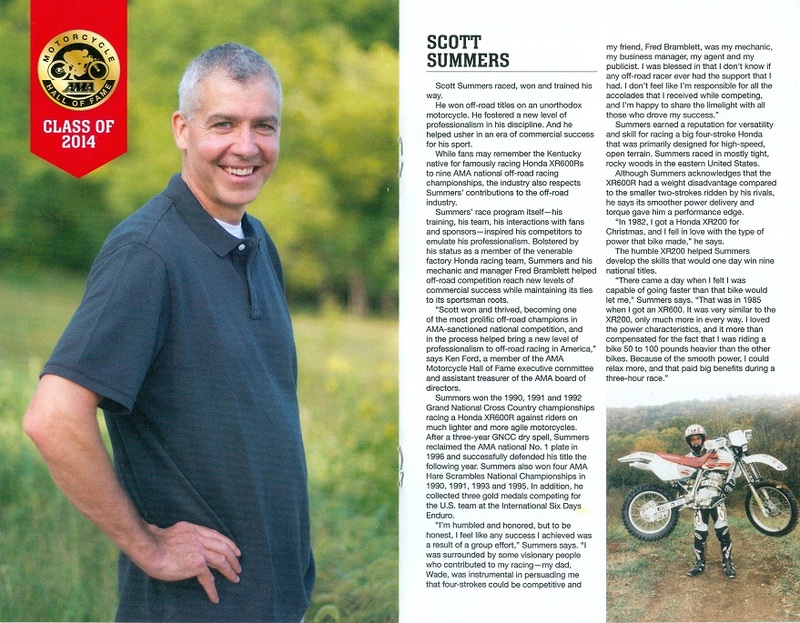 Gerrit Does being a USA BMX Hall of Fame member, class of 1998 and brother in law Pierre Karsmakers being a AMA Motorcycle Hall of Fame member, class of 2014. 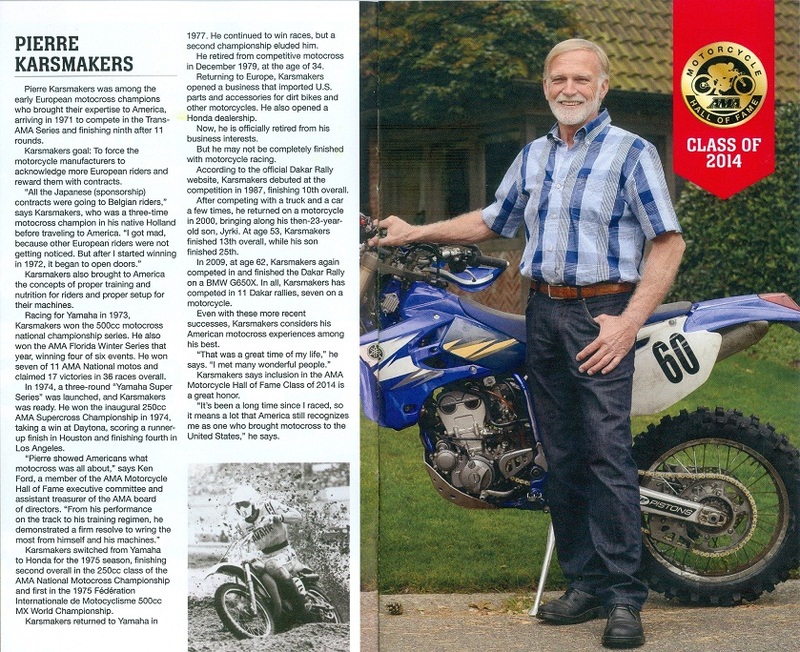 AMA Hall of Famer, Pierre Karsmakers, class of 2014. 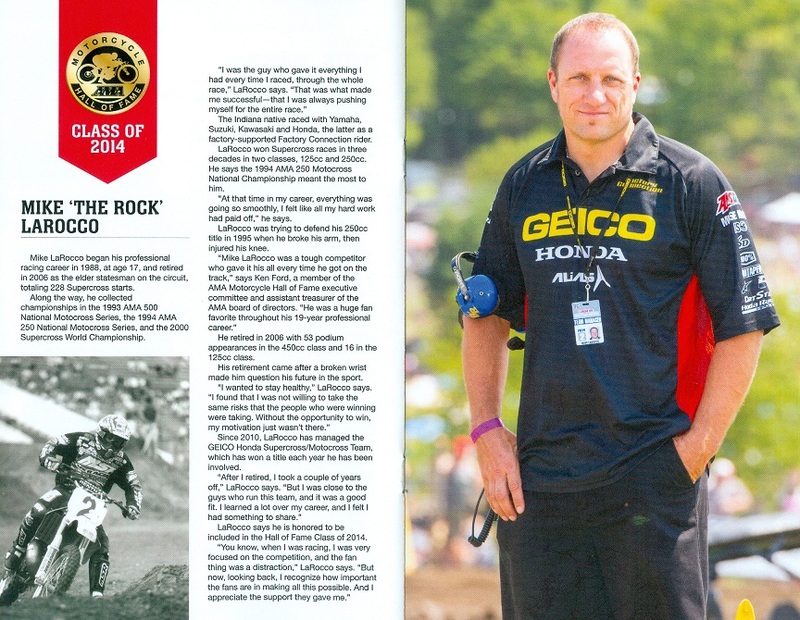 USA BMX Hall of Famer, Gerrit Does, class of 1998. © 2016 University of BMX by Gerrit Does - All Rights Reserved. Designed by Four05 Internet Oldenzaal.